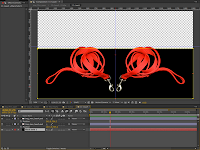 After Effects comp with both the Leash and Collar comps. 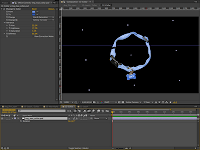 Last week, in a blog called "Dissecting the Video: MGM-Style Film Open (Part 1)", we began the process of building an MGM-style film open in Adobe After Effects. We gathered the elements needed, and began the process of preparing each element for the final composite. When we left off last time, we had just finished separating the background from the video of Max the dog. This week we'll talk about preparing the leash and collar layers that surround the "roaring" dog. The Leash Comp in After Effects. We'll start with the Leash Comp. For this comp there are three layers, a Black Solid on the bottom, and the image of the leash on the top two layers. As we mentioned last week, the leash was imported with alpha by way of Adobe Photoshop. You'll notice that the original color of the leash is red, we'll correct that in a later comp. The first layer of the leash is put into position with the silver snap-hook just outside of the center line. Once in position, this layer is duplicated and flipped horizontally. Position this new layer so that its silver snap-hook is off the center line the same amount as the original layer. A matte has been added to the Black Solid so that it is only visible behind the leash. This is so that when it is composited with Max, it blocks the lower part of his body. The Collar Comp in After Effects. Next we'll build the composite for the Collar - the Collar Comp. The Photoshop image of the collar is brought in with alpha. It is placed in the center of the screen and rotated so that the tag is at the bottom of the circle. I used a a Change To Color effect to enhance the color of the collar and tag. Once both the Leash and the Collar comps are complete, it's time to build a comp that contains both comps. Having both the leash and the collar in one comp, makes it easier in the final composite when Max's nose is in front of parts of the collar while his body remains behind the collar. The Leash / Collar Comp is a relatively simple comp. 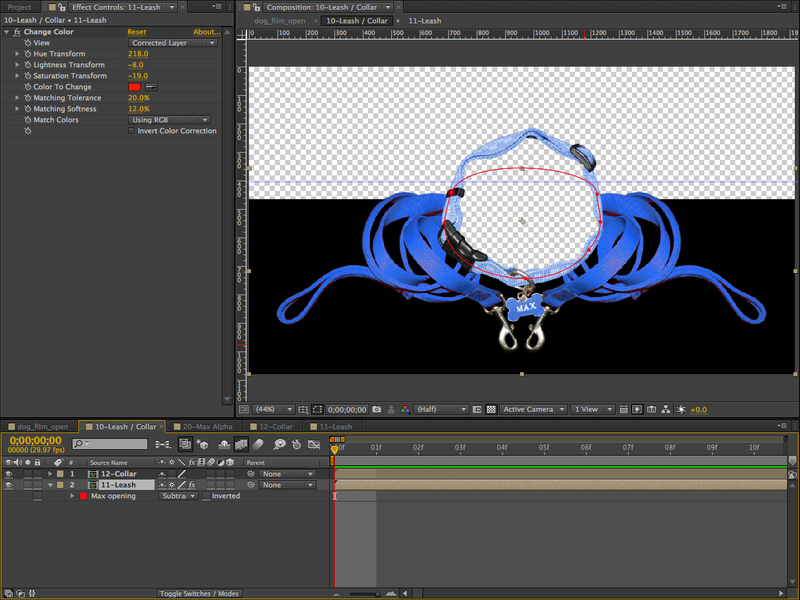 It basically holds both the Leash and Collar in place for the final composite. The Leash Comp is place on the bottom layer with the Collar Comp above it. 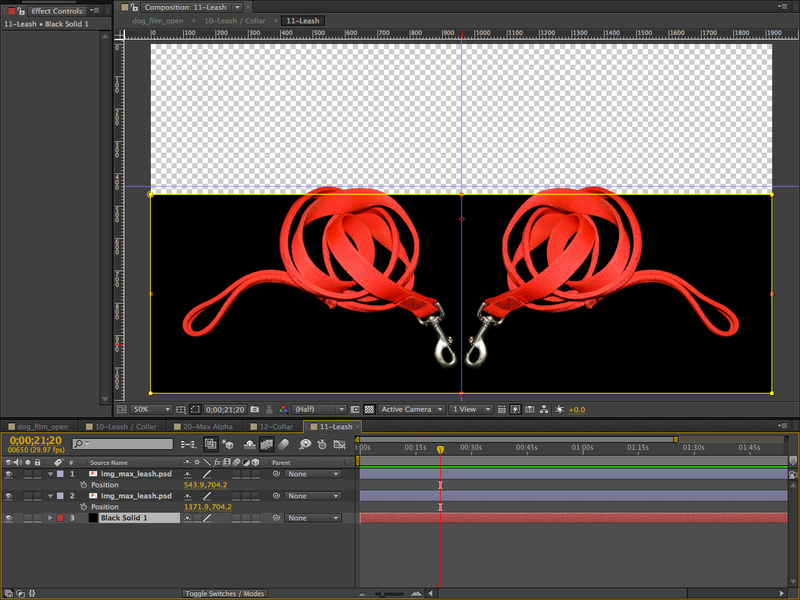 A matte is used on the Leash layer to cut an opening behind the collar (the "Max opening" mask in the top illustration). It's at this point when a Change Color effect is placed on the Leash layer to change its color from red to blue. All the elements are now ready for the final composite. Next week in the blog titled "Dissecting the Video: MGM-Style Film Open (Part 3)", we'll cover the final steps required to put all the elements together. Below is the final version of the video.